In a long-awaited reform, four Chinese provincial regions have removed the rural/urban distinction in the household registration system, or “hukou“, making things fairer for residents, chinanews.com reported. The regions stipulated there will be no more rural hukou and urban hukou, with both rural and urban dwellers registered as “residents”. 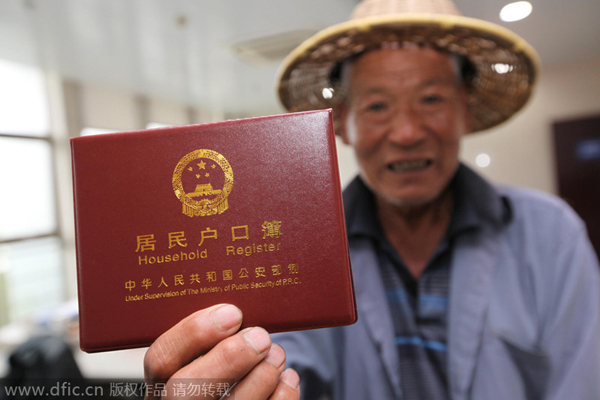 They are the first provinces to put into action a State Council document on reform of China’s household registration system, which was released on July 30, urging officials to scrap the urban-rural distinction. Northeast China’s Heilongjiang province said the distinction was removed since Nov 1 this year, and people can now change their hukou at local public security stations. For example, dwellers with a “rural hukou” can change it for one that just reads “resident”. Southwest China’s Guizhou province and East China’s Jiangxi province also introduced drafts of reform plans, and the public’s feedback is being solicited on the drafts. Guizhou’s draft schemes propose that from Jan 1 next year, households will no longer be labeled as “urban or rural” but as “collective households or family households”. The collective households refer to those who register under an organization, such as a workplace. Set up in 1958 in order to control mass urbanization, China’s hukou system effectively divided the population in two – urban households and rural households. via Four regions to scrap urban-rural ‘hukou’ distinction – China – Chinadaily.com.cn. China Daily: “China has clarified its residence policies to facilitate domestic migrants’ settling in small and medium-size cities as permanent residents, a move intended to further push theurbanization drive. In cities of county-level or below, people who have stable jobs and residences may apply forpermanent residence permits, along with their spouses, unmarried children, and parents,according to a State Council circular posted online late Thursday. In medium-size cities, people who have stable jobs for three years, stable residences, and havepaid social security insurance for at least one year, can also apply for permits to live in the citypermanently, the circular said. That means many of China’s millions of migrant workers may be formally accepted as urbanresidents, giving them more access to public services including welfare housing and medicalinsurance, which are currently only open to holders of permanent residence permits in manycities. Ushered in some 30 years ago, China’s reform and opening-up drive established a pattern oflabor flowing from rural to urban areas, and the country now has more than 200 million ruralmigrants working in cities. Some would regards these moves as a natural progression towards recognising the needs and rights of this important 20% of the Chinese population. Others, more cynically, would ask: “Why now?” and come to the conclusion that in the year of top leadership change, minimising the causes of internal conflict is of prime importance.